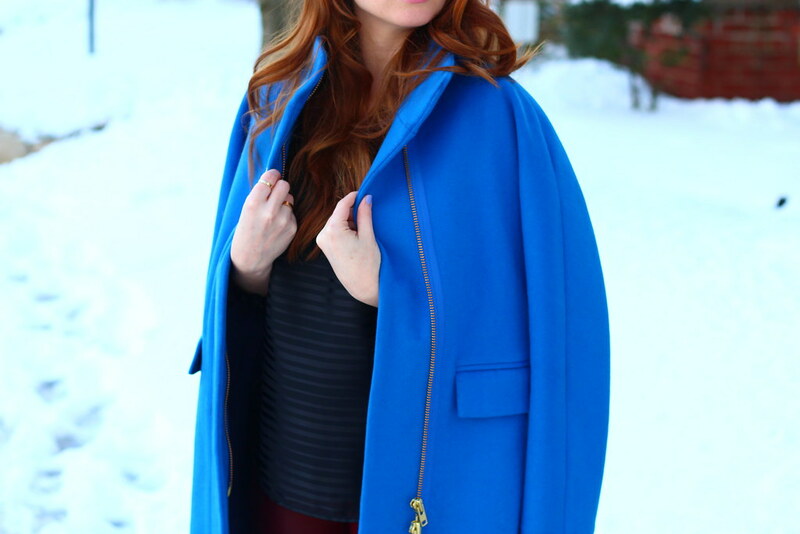 I wore the oxblood/cobalt combo back in September (here) when I was in NYC for Fashion Week, and have been meaning to pair these leggings with this coat since I got it. I stand by how much I love the unexpected compatibility of these two colors -- and actually wish I had more pieces to combine! In other news, it's still freezing outside. And I definitely stepped in snow while taking these pictures. Afterwards, I promtly returned to the house and swapped out my heels for booties and socks. Spring where are you!? You are stunning! Love this look, and the draped coat is so chic! Such a gorgeous, unexpected color combo! Although, anything with cobalt blue wins my heart. Such a cute look! Loving that coat! Those colors look great together. I may need to invest in a pair of pants like those.